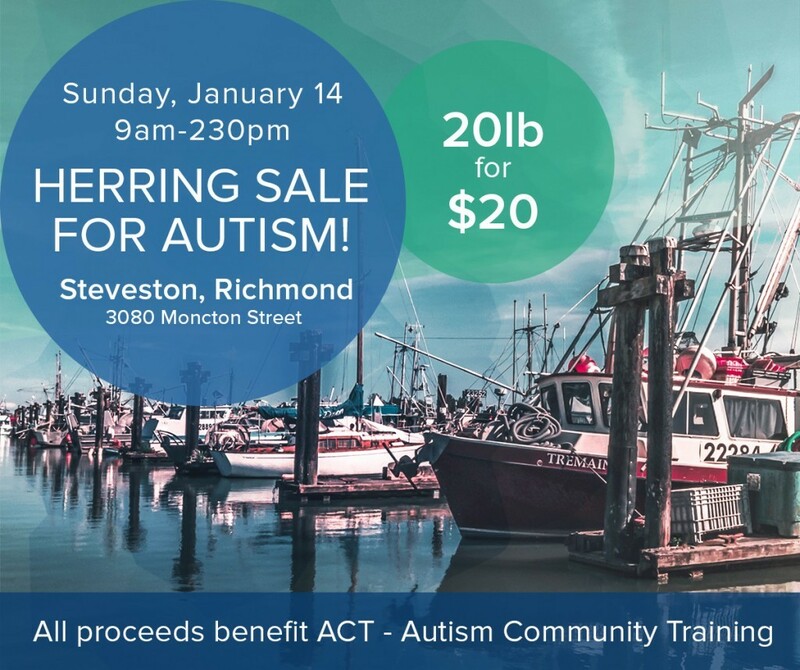 To kick off fundraising in 2018, ACT – Autism Community Training will benefit from a ‘Herring for Autism Sale’, sponsored by Oceanside Fisheries, on Sunday, January 14 in Steveston, Richmond, the heart of the Lower Mainland’s fishing industry. ACT is stepping up its fundraising efforts to ensure it can maintain its extensive free online autism resources. The B.C. Liberal Government cut funding for community-based autism information services in 2017. Why: Fresh herring is a delicacy for many international cuisines, from Scandinavia to China. Cost: The bags are $20 each with all proceeds going to ACT. ACT volunteers will deliver the herring to the cars of eager customers. Payment in cash, credit, or debit. Steveston’s fishing industry is renowned for its generous support for those with special needs in B.C., but Oceanside Fisheries owners Mike Rekis and Anne McCaw have a special tie to the autism community: “Our daughter is a very able adult now, but we haven’t forgotten how important ACT is to the success of children and adults with autism. We are supporting ACT because our family believes that the next generation of B.C. children deserves to have access to ACT’s impartial information and training resources,” explains Anne McCaw, a former ACT Board Member. According to the Government of B.C., nearly 1 out of every 61 children in the province has an autism diagnosis – nearly 13,000 children as of the end of 2016. ASD affects a child’s ability to communicate and engage socially. With effective intervention and support at home and at school, the majority will learn to communicate and to engage effectively in school, the community and in employment environments. ACT provides evidence-informed information and training on ASD to parents and professionals – the most comprehensive community-level autism information service in Canada. Since the government of B.C. cancelled funding in 2017, ACT’s relies on sponsors, donors and registration fees to support our information resources. ACT is a registered charity; our charitable tax number is #861691236RR0001. Over 1,200 vetted B.C. community resources from dentists to horses! ACT’s Monthly News Round-Up – reaching over 7,000 individuals and organizations in B.C. In 2017, ACT held nine events in three communities. 1,200 people received over 14,000 hours of training, in-person and via live web streaming. This entry was posted in Uncategorized on January 5, 2018 by ACT.